What did you hear about sororities before you went through recruitment? I heard sororities at ASU were all about partying, however, it should be noted that that's the general stereotype about ASU as a whole. People told me I would be "buying my friends." How much of it was true? Well, we definitely had our fair share of fun! It was definitely not all about the party though, we participated in a lot of charitable work as well. As far as "buying my friends" .... That's just a silly thing people like to say. I met two of my best friends through AXO. What encouraged you to go through recruitment? I can't say that anything in particular encouraged me. I had my mind set from the beginning. Who was the first person you fell in love with in your house? A girl named Drew. She was super sweet and funny. I felt instantly comfortable. I can't say there is one particular moment that I would call my favorite. But, I did love the date parties! If you could go back in time, what would you want to relive in your sorority? The first moment I met my best friends. It's crazy to think it's been almost 10 years since that time. Any advice for anyone going through recruitment? Be yourself and trust your instinct. 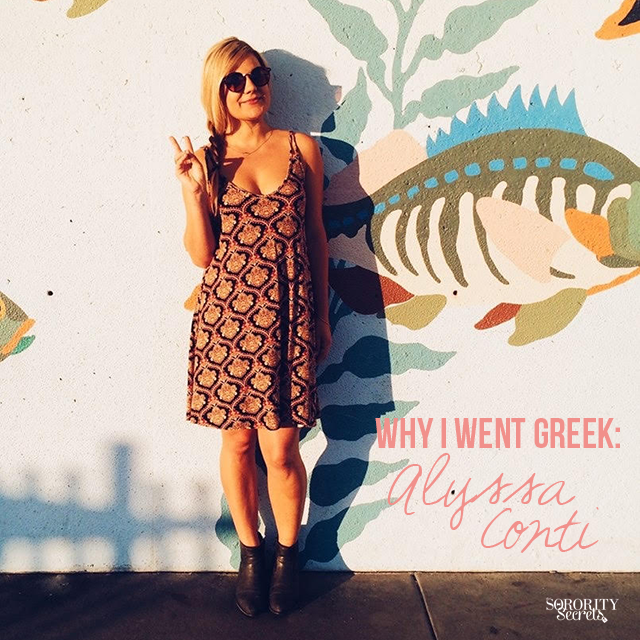 Thanks for sharing your sorority experience, Alyssa! If you have questions for Alyssa leave them in the comment's section below!